There’s no stopping Square Enix now; it looks like the company won’t be satisfied until every past game in the Final Fantasy series has made its way to PC in some form or fashion. Not that we’re complaining – more JRPG goodness is never a bad thing. 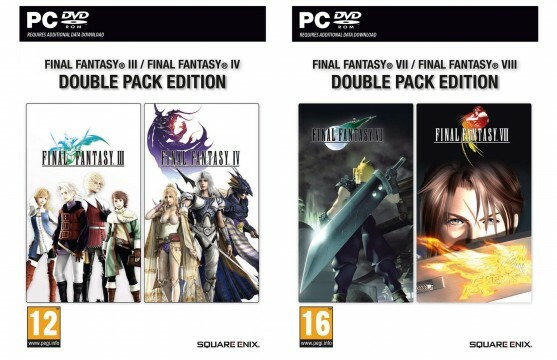 Both packs are priced at £19.99 (approx. $30). However, neither bundle appears to be available on Amazon’s North American site as of the time of writing. Both bundles are listed as having a release date of May 27. With Final Fantasy XV set to release this year, and then the Final Fantasy VII Remake presumably releasing after that, Square Enix certainly has their work cut out for them. Will the wait for either be worth it? It’s no secret that XV‘s development history has been tumultuous, to say the least, but from what Square has shown the world so far, the game certainly looks promising, as well as impossibly good-looking. We’ll know for sure come September 30.